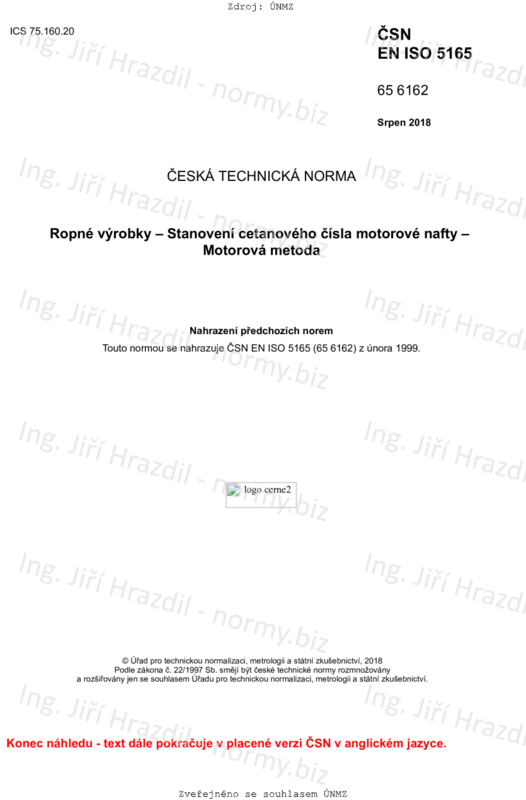 This document establishes the rating of diesel fuel oil in terms of an arbitrary scale of cetane numbers (CNs) using a standard single cylinder, four-stroke cycle, variable compression ratio, indirect injected diesel engine. The CN provides a measure of the ignition characteristics of diesel fuel oil in compression ignition engines. The CN is determined at constant speed in a pre-combustion chamber-type compression ignition test engine. However, the relationship of test engine performance to full scale, variable speed and variable load engines is not completely understood. This document is applicable for the entire scale range from 0 CN to 100 CN but typical testing is in the range of 30 CN to 65 CN. An interlaboratory study executed by CEN in 2013 (10 samples in the range 52,4 CN to 73,8 CN) confirmed that paraffinic diesel from synthesis or hydrotreatment, containing up to 7 % (V/V) fatty acid methyl ester (FAME) can be tested by this test method and that the precision is comparable to conventional fuels. NOTE: This document specifies operating conditions in SI units but engine measurements are specified in inch-pound units because these are the historical units used in the manufacture of the equipment, and thus some references in this document include these units in parenthesis.